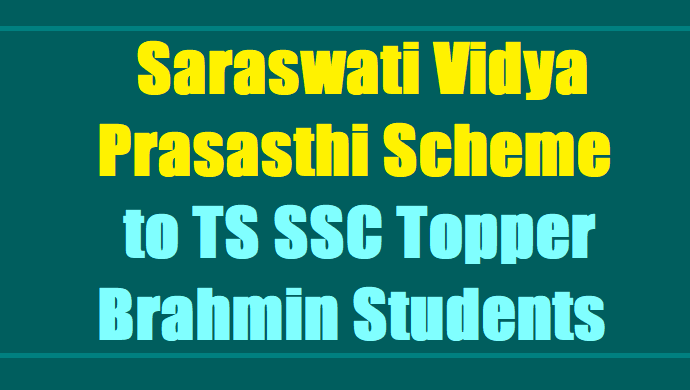 Saraswati Vidya Prasasthi Scheme to TS SSC topper Brahmin Students to pursue higher education 2017: SVPS Scheme Cash reward to SSC Brahmin toppers, Saraswati Vidya Prasasthi Scheme to Topper Brahmin Student(topper among the SSC Brahmin Students). Prescribed Formats, Certificates to Brahmin Students. SSC Public Examinations, March 2017 - Furnishing certain information in respect of Brahrnin students - Reg. Ref: Govt. Memo No.5576/SE.GEN/ Al /2017 dt. 26-07-2017 . With reference to the subject cited, I am to inform you that the Telangana Brahmin Samkshcrna Parishad has taken up an initiative in launching Saraswati Vidya Prasasthi Scheme under which Brahmin student stood topper in the SSC Public Examinations, March 2017 from Telangana State Schools (Govt. & Recognised Schools) will be given certain cash reward to encourage him/her for pursuing Higher Education. In this regard it is requested to issue a certificate and Bonafide from the School/ Educational institute in respect of the candidate concerned. In view of the above, I request you to communicate the enclosed instructions to all the Heads of Institutions under your control in order to issue certificate in the prescribed formal to the Topper student of the School and send the consolidated information of the district to Dr.K.V.Ramana Chary, IAS, (Retd. ), .Chairman , Telangana Brahmana Samksherna Parishad and Adviser to Government, Secretariat, Telangana at your end. Telangana Brahmin Samkshema Parishad - Saraswati Vidya rasasthi Scheme - Issue of Topper 86 Bona Fide Certificates to Brahmin Students - Reg. 1. My D.O.Letter dated 21.7.2017. 2. Govt. Memo.No5576/SE.GEN/A1/2017, SE (Genl) Dept., Dt.26.7.2017. 3. Govt. Memo No.4136/0P86MC/A2/2017, HE(OP) Dept., dt. 22.7.2017. Kindly refer to my D.O. letter first cited. I thank you very much for promptly communicating instructions to the Heads of Departments concerned vide references 2nd and 3rd cited. At a review meeting of the Parishad held on 1.9.2017 it was observed that there is not much response from the students to avail the cash award under Saraswathi Vidya Prasasthi Scheme due to limiting it to one student per Institution. Therefore, it is now decided to make eligible all the students of Brahmin Community who secure more than the cut off marks below. 5. Professional Education 80 per cent and above. In view of the above, I request to kindly arrange to issue suitable instructions to all the Heads of Departments concerned, in modification of the earlier guidelines issued in this regard. Dr.K.V.Ramana Chary, IAS, (Retd. ), .Chairman of Telangana Brahmana Samksherna Parishad: As you arc aware, Government have constituted Telangana Brahmin Sanaksherna Parishad vide GO. 267 General Administration (Cabinet) Department, dated, 28.1.2017, with a view to extend a helping hand to the needy Brahmin community in the State, specialty the Brahmin youth, in matters of education, health care, training in skills Development, welfare, entreprenerial programmes, etc. SSC/Diploma/Degree/PG /Professional course and is Topper from that school/College/Institutions in he given certain cash reward to encourage him/her pursue higher education. The details of Category-wise marks and the amount of cash rewards under the scheme. In order to avail the benefit under the Saraswati Vidya Prasasthi Scheme by Topper Brahmin Student, we have made it mandatory that a Certificate from the educational institution concerned is to be Submitted in thy effect of being a topper among the Brahmin Students and also Bonafide Certificate from higher institution in which he/she he joined.